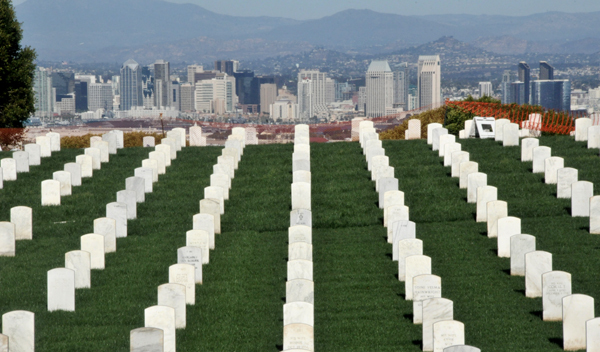 Public observance of Memorial Day in San Diego began Saturday with American flags placed at grave sites at the Fort Rosecrans National Cemetery. The flag-laying event began at 8 a.m. with a ceremony at the cemetery’s rostrum that included Rep. Scott Peters. Monday’s Memorial Day commemoration at the cemetery will begin at 10 a.m. and feature remarks from Vice Adm. Nora Tyson, commander of the Navy’s Third Fleet. Several other pre-Memorial Day events were planned for Saturday. At the Veterans Museum in Balboa Park, members of the Vietnam Veterans of America Post 442 are conducting a weekend-long reading of names of those killed in action. Writers formerly in the military associated with a La Jolla Playhouse group will read from their works beginning at 1 p.m. at the museum, which will also host a candlelight vigil at 7 p.m.
At the USS Midway Aircraft Carrier Museum, a wreath ceremony was held in the morning. The band Lifehouse will headline the seventh annual Freedom Concert aboard the museum beginning at 7:30 p.m. Proceeds will be donated to Support The Enlisted Project, United Through Reading and the Navy SEAL Foundation.